The country could become self-reliant once the semi-cryogenic engine is developed, he said. IPRC has started the assembly, integration and testing facilities and is set to achieve a milestone in the next three years, he said. The semi-cryogenic engine, using kerosene as fuel and liquid oxygen as oxidiser, is currently being designed and developed. The refined and purified kerosene to be used as fuel has been named as ‘isrosene’, the scientist said. So..this "Special Correspondent" gets to talk about semi cryo progress and doesn't check on status of upcoming tests abroad, gets to talk about air breathing tech doesn't check upon ATV-D02... AND is talking about this absolutely INANE stuff like Isrosene..and "One dollar per one kg by ESA" Doesn't check on HAT tests OR C25 stage integration timeline either... I commented on article I doubt it'll get published. Manufacture of thrust chamber and pre-burner of Semi-Cryo engine requires joining of two shells by vacuum brazing. The inner shell is made of a copper alloy, whereas the outer shell is made of stainless steel. The inner shell has ribs on its outer surface which need to be joined to the inner shell. This joining is achieved by brazing which results in formation of active cooling channels in the finished hardware. The usual process of brazing uses a metal foil placed between the two shells. When the assembly is heated, the foil melts and a braze joint is formed. This is a time consuming and labour intensive process. Moreover, the hardware has to be rotated during brazing to avoid accumulation of braze metal in the channels. In order to overcome these limitations, a new brazing process has been developed which involves the use of coated base metals. At appropriate brazing temperature, the sandwich layer melts and forms in-situ braze alloy between the joints. In the present development, an attempt is made to achieve braze joint through ‘static’ technique rather than hitherto followed method at ISRO of ‘rotary’ brazing. For the thrust chamber, vacuum brazing is to be carried out between martensitic stainless steel and copper alloy. To form the braze joint, a layer of copper and silver coating is provided on the base materials to be joined. A schematic of the coating arrangement is given in Figure 1. Nickel coating is applied to act as a barrier between braze metal and steel. 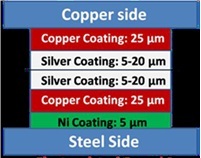 Figure 2 shows a cross section of electroplated steel and copper. Initial experiments for process optimization were carried in coupon level in a vacuum furnace. Several such experiments were conducted to optimize the silver layer thickness, brazing temperature, brazing time and load. Using the optimized process, flat plates with milled channels were brazed to simulate thrust chamber configuration and pressure tested. Figure 3 shows the joint made with two flat plates. Pressure testing was done up to 600 bar and no de-bonding was observed after the pressure test.Subsequently, pre-burner prototype hardware were fabricated and coated for the performance evaluation. A differential pressure is essential to ensure proper hugging of the cylindrical hardware assembly. 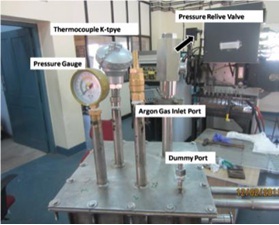 For this purpose a Vacuum compression setup was designed and fabricated in-house in VSSC (Figure 4 and 5).Using this setup, subscale hardware was realized and was evaluated through X-Ray radiography and was pressure tested by Semi Cryo Project team. It was confirmed that the hardware were free of blocks in the channels through X-Ray radiography. Pressure testing was done up to 500 bar and no de-bonding was observed. Figure 6 show the hardware and the cut cross section with typical rib fracture observed beyond 500 bar which implies the soundness of the brazed joint. • Time consuming and laborious brazing foil assembly on the contoured ribs is simplified. ...Pressure testing was done up to 500 bar and no de-bonding was observed. Figure 6 show the hardware and the cut cross section with typical rib fracture observed beyond 500 bar which implies the soundness of the brazed joint. Yes, the electroplating steps they picked are very basic. Thickness distribution limits were very generous. I would like to know when they plan on hot testing this engine? The pick of the braze filler is going to make this a relatively low temperature joint gated by the liquidus of the silver. Higher temperature electroplated braze materials are available. I can't be specific here, please understand. Furthermore, pressure testing to 500 bar will only likely test the joint in tension ( normal to the joint ) electroplated deposits often fail in shear, which will be experienced during hot fire. Thermal gradients between inner & outer jackets, coupled with CTE mismatch between stainless and copper will also induce shear. Probably going to be just fine for semi-cryo engine. Hopefully, by end of this year testing would start. Integrated Technical Reviews of semi cryogenic Engine by the National Expert Panel has ratified the engine specifications, system configuration and approach adopted for design of major engine sub-systems and the engine development/qualification plan. Fabrication of engine subsystems i.e., Thrust Chamber, Mixing head, Main Turbo pump, Booster Turbo pumps, Pre-burner and Heat Exchanger are in progress. Cold flow tests (five tests in noncavitation mode) of Low Pressure Oxidiser Turbo Pump (LPOT) were conducted at newly established Cold Flow Test facility (CFT) at IPRC, Mahendragiri. Semi cryo pre burner single element injector hot tests (11 nos.) were also conducted demonstrating the ignition with hypergolic igniter and flame holding at very high mixture ratios. Isrosene commercial-scale production technology seems to be realized (HOCL 2014-15 annual report). After initial trial runs on pilot scale the ‘In-house’ developed vapour phase continuous process for ISRO’s specific grade of Kerosene (Isrosene) was fine tuned. A model developed on laboratory scale was also verified on pilot plant scale. Regular runs with optimized parameters in ‘scaled down version’ of HOC’s commercial plant were successfully completed. The product quality from these runs has been re-affirmed and the capacity of the plant has also been established, based on these runs. The technology is now ready for implementation in HOC’s available commercial plant. In this regard meeting with ISRO was held. The detailed proposal was sent to ISRO. Company’s further contribution in IPR field is maintained and grant of three nos. of Indian patents has been obtained during this year. Attached is zip file of some screen captures. Resolution is not so good as the video is only 360p with the slides only partially filling the screen. I wonder where they plan to do the first test firing of SCE-200. Is the new test facility at IPRC nearing completion? I am not sure why ROSCOSMOS doesn't partner more aggressively with India. India is a large market that can help sustain Russian space program by the way of shared costs. And jointly both India and Russia can endeavor towards cutting edge space research instead of one attempting to re-invent the wheel and the other cutting down on space budgets. First test firing of SCE-200 at IPRC is targeted for 3rd quarter 2017. Cold flow tests have already been completed and subsystem testing is underway. This is going to be a massive leap for ISRO in terms of liquid fuel tech. To go from 76 tons thrust/270-290 sec impulse to 182 tons thrust/299 sec impulse is a jump to say the least. Given the fact they are developing this engine with reusability in mind i wonder why they choose a oxidiser rich cycle instead of a full flow staged combustion cycle which is more efficient and exerts less stress on the engine and improves reusability as a result. Still with this engine india will have a single chamber RD-180 class engine. Given the fact they are developing this engine with reusability in mind i wonder why they choose a oxidiser rich cycle instead of a full flow staged combustion cycle which is more efficient and exerts less stress on the engine and improves reusability as a result. I thought an oxidiser rich cycle was full flow stage combustion?!! 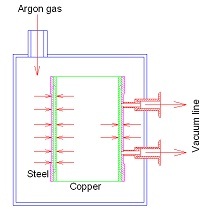 There are no gases/liquids that do not end up in the combustion chamber. I thought the definition of full flow staged combustion is that all propellants go through the turbines, all fluids ending up in the combustion chamber happens in all types of staged combustion, as well as expander cycle. The difference between oxidiser rich and full flow staged combustion, according to my understanding of Wikipedia's https://en.wikipedia.org/wiki/Staged_combustion_cycle, is that in the first not all of the fuel goes through the turbines. Please correct me on this if I'm wrong. From what I have heard, the advantage of an oxidizer-rich cycle (as against a fuel-rich cycle) is its higher efficiency and better performance characteristics, while the downside is that it is more corrossive to the engine parts and hence impacts reusability? This would mean the upcoming test facilities for this engine in IPRC would be ready by then? Btw, I guess the working equivalent for this engine would be the RD-191 (single chamber version of RD-180) which powers the Angara. ISRO themselves class it as a "Oxidiser rich staged combustion cycle"
Yes from my research it seems like they have decided to skip testing in russia and test at their own facility. For the past year or so no mentions of testing in russia have surfaced so i am assuming this is the case.